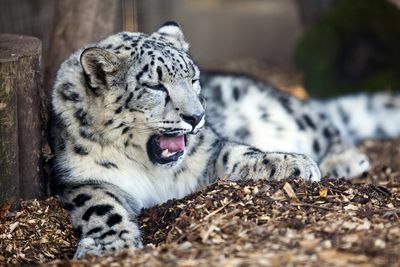 A stone’s throw from London, the Cat Survival Trust has the largest collection of snow leopards outside of Asia. ‘Snow Leopards of Leafy London’ is an observational documentary series that captures intimate never-seen-before footage of snow leopards. Presented by wildlife filmmaker Adrian Cale, the series takes us to the very heart of snow leopard conservation via the quirky suburbs of England. Dr Terry Moore is a quiet unassuming man with a remarkable passion for snow leopards. His connection with these enigmatic cats is extraordinary, and his methods unashamedly unorthodox. Adrian will find out just what goes into keeping snow leopards, Terry style, along with the day-to- day work of the Trust and their other cat residents from behind and in front of camera, gaining an insight into the bigger picture of cat conservation and developing his own bond with snow leopards along the way.